Hollyhock (Alcea setosa) is a tough drought-tolerant perennial native to the eastern Mediterranean region. It grows naturally in Jordan in wastelands and on roadsides as far up north as Irbid and down south as Tafila. Its showy spikes with attractive pink flowers bloom from April to June. Hollyhock grows to a height of 1.0 – 2.0m, with a spread of 0.4m. It has fast a fast growth rate, taking six months to one year to reach its mature size. Requirements: Grows in full sun. Can tolerate poor soil, but requires good drainage. Water usage: Requires no watering once established. Hollyhocks that are not irrigated, however, will be smaller than their irrigated counterparts. 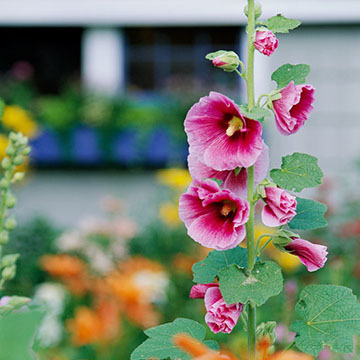 Appearance: The Hollyhock is a striking perennial, usually growing with one long stem. It has rough, heart-shaped leaves that are 7 – 15cm long. The attractive flower heads are 8 - 12cm wide, and are arranged around the main stem. Notes on use: Grown for its tall stem and colorful flowers; good against walls or at the back of borders; provides a strong vertical accent. Propagation: Propagates easily by seed gathered in late summer. Sow in fall for spring bloom. Maintenance: For a second flush of flowers, cut the stems to the ground after the first bloom fades. Make sure plant is fertilized and well irrigated to allow it to produce the second bloom. Notes: Dried Hollyhock flower buds are used as a main component of herbal teas.